I am really excited about finally being able to study Homeopathy and I absolutely love your thorough high-level professional course. I love everything about it - firstly the flexibility of study years, which for my lifestyle is essential, but then the top quality recommended books, the clear, concise study manual, the outstanding audio CDs are so appreciated. I am so impressed by the way you have perfected your correspondence course. I have taken various correspondence courses and not one has ever matched your quality, I really thank you for the service you are providing to humanity through this course. I love my studies, I wish I were able to dedicate my time to them full-time. However, that is not possible right now. I am not sure at what speed I will be able to work through the course, it all depends on so many factors. There are times we are busier than others, and I am perfectionist by nature, so I really would rather go a little slower but acquire a thorough knowledge. What I found most difficult with the course initially was setting up a system for studying each remedy. There is such a wealth of information in all the superlative books, I was overwhelmed and incredibly impressed by all the work each author had done in the field in order to accumulate so much knowledge. However, each remedy became easier as I decided upon the categories I would focus on, and no doubt I will be modifying and perfecting my system throughout the course. So the first remedies took real long, but by the fourth and fifth ones I speeded up considerably. I loved the philosophy part of homeopathy, I find it really fascinating and quite awe-inspiring. The more I study homeopathy, the more I love it. I feel real passionate about it really and am enthused to help many people with it in the future. I would highly recommend your course to anyone interested in Homeopathy. It is outstanding in every way. So really thank you Amanda and all the great work you guys are doing through your school in England. You can know that's it so appreciated from this end and I'm sure by so many others. There is nothing to beat high quality training and yours is of the highest. Thank you for giving me a life changing, beautiful experience. As I talk to more and more people (graduates and current students of other colleges), I realise what a wonderful experience the School was. I talk to so many who are angry and dissatisfied with their colleges. And I tell them how much I loved mine! I tell them how it was more than a college, how it changed and nurtured me in ways that are sometimes difficult to describe. Not only did I receive the best homeopathic education, one that is actually world renowned, but I received something that changed my life in the best way possible. One of the best things was how you gently fostered a group spirit among us ?? even when some of us (like me) resisted that approach. I remember in the early years saying to someone, "I'm only here to learn homeopathy!" Boy, was I wrong! I was here to learn much more about life and love. Well you know! Studying at the School of Homeopathy is like stepping into another world. You leave the mad pace of life behind and enter a welcome haven of tranquility. Here the tutors are there to support you on your journey with such faith in you that you cannot fail to achieve your potential. Good schooling should give the student a knowledge-base, founded on others' wisdom and experience. Another objective, which might appear contradictory, is developing the confidence to venture alone and develop one's own ideas. The School of Homeopathy, very skillfully, manages to achieve both these targets. This is a difficult challenge: none of the (quite a few) institutions for higher education in which I've studied managed to rise to it. And, most important, the school has so much confidence in the ability of the student to succeed, that, as a student, you are inevitably empowered by this autonomy. What I also like is the spiritual aspect of the school. Homeopathy can be practiced in many forms, and there are ways to make it easy and practical. But practical solutions will be limited to treating practical problems. With the kind of learning we got here homeopathy can be a real transformative power in patients' lives. It's been wonderful four years - I couldn't hope for a better school to learn homeopathy in. I came to homeopathy through my daughter's deteriorating health right after birth due to mis-diagnosis and subsequent mis-treatment by the paediatrician on duty at the hospital at the time. She was in neonatal care for four days and given antibiotics for an infection she didn't have. When we got home she had diarrhoea, thrush and weight loss and none of the regular doctors could effect any improvement. After unsuccessful visits to the regular doctors, we finally saw a homeopath and right away things improved. Thereafter I was 'hooked' to find out more and understand how homeopathy worked. One of the main reasons I started studying homeopathy, is that I feel very strongly about having the ability to help my family and not have to depend on mainstream health care again. I was born and raised in Hong Kong (German parentage), and have lived in Europe and South America, before settling in Toronto now. I worked for 16 years in numerous varying jobs, before settling and having a daughter, having been famous amongst my friends for changing jobs the whole time, with mixed results. Most of the jobs were related to marketing/projects in the hotel business and towards the end working as a PA for presidents of multi national (usually German) companies in Hong Kong. None really satisfied me, in part because I'd lose interest or lose the respect for my superiors. Originally I was always interested in both philosophy as well as anything to do with natural laws, but since I didn't want to stay in Germany (where I went to school most of the time but did not get on with the educational system), I decided to take up work in the hotel business to get me abroad. Learning to be a homeopath finally combines all my interests. In particular it gives me great satisfaction and a sense of not being helpless regarding the care of both my own and my family's health (and that of others in the future). The way public health in general is going, I believe there will be a great and urgent need for homeopaths and other holistic practitioners and I can only hope to qualify ASAP! Alternative Training and the Devon School were recommended to me by a friend and homeopath while living in Italy. I checked the webpage and read the brochures and didn't really bother much about searching for others. The set-up of the school and Misha's reputation assured me. The flexibility that the school gives is a major relief, especially with the upheavals of living and moving to various different countries/continents. The tutor has always been nothing but supportive throughout and the school's international programme caters well for that. What I do greatly miss is connecting with other homeopathically minded people on a more regular basis. I have found the yearly summer camp at Uffculme to be a great boost every time and the chat room sessions very useful in 'combating' the relative isolation you feel at times studying all on your own. I would mention that the personal touch and involvement of all the Norlands is a great feature and something I believe most students agree on - it is one of the great advantages of the school. When I started out with my diploma in hand, I was unsure that I could put what I had learnt into practice. I so much wanted to be the best practitioner! But I soon found that what I had been taught at the School of Homeopathy held me steady and guided me. I realised that the education and the spirit which informed it was special. I had received a vision of what healing could achieve at the highest level and I was and am passing this on, helping people live at their full potential. This healing is more than just treating symptoms, it is inspirational and it has become an everyday part of my life. I have thought about the School a lot. Many times I have closed my eyes and felt very grateful for the spacious minded and spiritual nurture and encouragement that I experienced! When I first went to the Mumbai seminar in 2000, although I very much felt like a novice when it came to experience, I was also aware that these 'ground breaking' ideas Sankaran was expounding, were very new to most yet had been given to us and nurtured in our training. My interest in alternative healing had been kindled in my teens but really caught fire after the first Buddhist retreat I did. I remembering leaving Dharamsala with the need to find some 'shop front' that I could use, that people would feel comfortable to walk through and I might be able to help people with. As I tend not to believe in coincidences, this motivation ultimately lead to your shop front, your particular embrace of homoeopathy and the spirit behind your teachings. I later met students from many different colleges and realised how unique the School's style is and how grateful I am that I developed my own style under its influence. Every patient gives me an insight into humanity, into suffering, into our commonality as humans and into my own nature, prejudices, sensitivities and blind spots. This makes it a very alive and dynamic practice, I must say! When I first started practicing, my wish was to be able to help at least one person with their 'health'; now I have been able to help many, many people, continually strengthening my weak spots and acknowledging my strengths, and generally not beating myself up so much for not being perfect. Thank you Misha, and all, for all the inspiration and pointers on this most incredible trek! I am lucky that my home is in the city of Chiang Mai in the north of Thailand. It is a very special place, here you get to meet and know a lot of eccentric people. Otherwise I would not have heard of homeopathy because it is very new in Thailand. In fact, there are so few homeopaths in Thailand that I have to see a homeopath in Hong Kong, where I was born, and some friends I have convinced of its power get treatment when they visit the USA. I discovered homeopathy after a recommendation from my dog trainer, and became so fascinated I decided to find out more. Now I am really hoping that one day I can practice because it's such an amazing healing art that surely everyone would be benefited. The course is ideal for me as I can fit it in with the other things in my life. As well as my studies, I am juggling running a business, which designs and produces wearable art using antique fabric and accessories and a full time job as a mum to two lovely yorkies. I began my career in hotel management, working in Hong Kong, Thailand and Cambodia. I also studied in the UK at the University of Bath, where I finished my MBA. Later I moved into marketing, and then into the kitchen supply business, eventually getting the job of chief executive officer of the biggest industrial kitchen supply, design and manufacturing group in Asia, where I stayed for three years until my boss, who was also from Hong Kong, was killed in a car accident at the age of 48. That was a wake-up call for me because at that time I was flying around a lot. I decided to quit my high profile job and move to Chiang Mai to try out a new business idea. I haven't looked back since. I enjoy my studies and really appreciate all the help from the school. Without a peer group, it takes a lot of discipline to sit down and get on with the study. When I was searching around, I compared the curriculum in great detail with other schools and found that Devon provided the most comprehensive one. It was the right choice for me. The response is very quick to any questions. Even though I'm half a world away, I know that should I need any support, I'll get it for sure and timely. Most importantly for me is that Devon is teaching classical homeopathy. In my opinion, any other way of 'practising' homeopathy is a deviation from the Organon. I came to homoeopathy after a friend suggested I seek alternative assistance for our son, James, who was stricken with an autistic-like disability as a result of vaccinational encephalitis. Through that first seminar, I knew instinctually that homoeopathy would be the path through which we would find the help which we so desperately sought. After the MMR vaccine, our James went from a totally normal 18-month-old, to complete deafness in both ears (as evaluated medically by a brain stem test), banging his head on his crib, and a nearly complete stoppage of all cognitive/language development. Through homoeopathic treatment, Jamie's hearing has been completely restored, language has increased, and he has been able to function in his world without the use of any allopathic medications. He is far from "cured", but we continue to move forward. Prior to devoting myself entirely to homoeopathic practise, I was a professional musician, having performed as a vocal soloist, orchestral/chamber music violist, and pianist throughout New England. As a teenager, I taught violin and viola lessons to younger students, and continued on with that practise until I began having children and took on more professional musical "gigs". I still play professionally upon occasion, and play daily for the sheer joy of it. I was also involved in the allopathic side of things through my experiences in nursing, but have found homoeopathy to be of such deeper and more lasting benefit that practising anything else seemed quite inadequate. I am the mother of three children - Betsy, Jamie, and Becca, (aged 20, 17, and 14) and the therapeutic foster mother of a two-year-old little girl with multiple medical and developmental issues. I have been married to my husband, John, for 21 years, and he has been so supportive of my studies! Currently I am nearing the finishing point in my homoeopathic studies with the School of Homoeopathy, and am taking cases under clinical supervision with the school, readying myself for independent practice. I have learnt such a great deal about myself through this study, finding that the pursuit of homeopathic practise is, in and of itself, a journey into one's own soul. As we strive to understand another's pain and disease, we are brought face to face with our own imbalances, and we are reminded - what needs to be cured? I have been so grateful for the growth that has taken place within me as a result of my studies with the school, both emotionally and professionally. 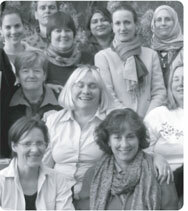 The courses have been thorough, detailed, and grounded in the solid foundations of classical homoeopathy. As one winds one's way through the course, the question: "will I ever be able to do this work, and do it well?" inevitably comes. I have come to realise that I have been well prepared by the school for the challenges of practice. The solid foundation of skills that I have received from the school allow me to feel very comfortable in any circumstances in which I have found myself. And I found the Pathology and Disease course wonderful. I really enjoyed the challenges with which Dr. Gascoigne provided me. I answered the first unit as written, and then Dr. Gascoigne changed the demands and format of the last three units, to allow for more thought and challenge, and I revelled in this! His incredible knowledge, experience, and ability to put me to task so increased my zeal for the subject that I was really quite saddened when it was all over! I hope to continue on with my association with Dr. Gascoigne as I enter into practice, and feel that I have a wonderful resource available to me. I realized that what I really wanted to do was to study and become a practitioner, that this was what had been missing for so long in my life, but how? It seemed to be a Herculean task to achieve when one lives in the middle of the Aegean Sea! I started to trawl the internet for whatever was available and wrote to nearly every homeopathic school in the UK and in Greece to try to find a way. When I found the excellent website of the School, I was thrilled. I knew I had finally found what I was looking for. I am positively storming the course, having started it in September 2004. I find myself so motivated that I work many hours a day on my studies. I have to say that it can be very lonely, as I don't really have anyone to chat to about homeopathy. I really look forward to the chat room sessions, as they are great chance to get a bit of contact. I went to the UK summer school this June which was a wonderful experience. Misha is such a special person and it was a pleasure and an honour to be able to spend this time with him. I will be attending the International Summer School next May and can hardly wait! I'd never heard of homeopathy before I came across it on the internet while I was looking for inspiration for a career change. I googled a few words like 'alternative medicine' and 'therapy' and 'holistic' and found homoeopathy. I read up on it and it seemed like the perfect area to go into and so I went in! I signed up for the correspondence course and it took my life solidly in the direction it had naturally been heading in for years. I initially trained in TV, Radio & Film after leaving school in my native Dublin but after taking a break for a few years where I worked in a variety of jobs, I decided that the TV, radio and film world wasn't for me. I ran into a friend who was studying to become a yoga teacher and I suddenly realised that I could go into that world. Previously, it had seemed closed to me like an esoteric kind of thing - stupid, I know. I spent three years studying the first year of the course which was ideal as I could fit it in with my life and full time work. I joined the attendance course in 2003. The difference between the two is that the correspondence course fitted in with my life, whereas my life is fitted in with the attendance course. While on the correspondence course, I went from bartender to office worker, trained in karate and t'ai ch'i, took up yoga, moved in with my now fiance, did a computer course, and moved to London. I learned a lot about myself due to it being up to me whether I study or not that day. The key thing about the correspondence course for me was that there were no deadlines for homework, so I had the time to explore the intriguing questions that inevitably come up when learning an art such as this. These included questions from my friends and others about homoeopathy that I wanted to answer. I was glad to have been given the time allowed by the correspondence course so that I could have a life while I learned about homoeopathy, so that I could explore the subject and the remedies while also doing homework and so that I could begin to fit it in and know whether I wanted to sacrifice more for it by going to the attendance course.